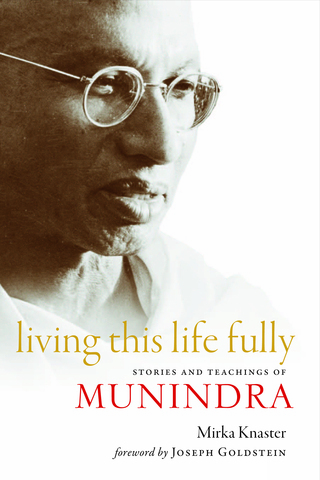 In poignant and humorous anecdotes, Munindra's students, family, and friends remember this unique and idiosyncratic teacher not only for his erudition and expert guidance, but especially for his embodiment of Dharma. He was one of those rare individuals who live what they teach, demonstrating seamless integration rather than conflicted separation between daily life and spiritual practice. Through his attitudes and behavior, he held out the potential of what is attainable: to be at home in this body, in this place, in this time, under these conditions--happy and at peace with oneself and in harmony with others. Munindra expressed in his being--by embodying 16 distinct qualities--what neuroscientists are now able to confirm through sophisticated technology: by training the mind, one can change the brain so that positive emotions become enduring traits of one's character rather than occasional states. Includes rare photographs. Available in English, Vietnamese, and Korean. A Comprehensive Guide to More than Fifty Mind-Body Practices that Can Relieve Pain, Reduce Stress, and Foster Health, Spiritual Growth, and Inner Peace (Bantam Books). An extremely practical and comprehensive resource, Discovering the Body’s Wisdom helps consumers and health care professionals become savvy about the numerous Eastern and Western body-mind disciplines or “bodyways” now available. It shows readers how to befriend their own bodies and get back in touch with their internal sources of health and wisdom. Includes illustrations and "experiences" to engage in for greater well-being and vitality. Available in English, Dutch, Russian, Chinese, and Portuguese. But this way of life now faces significant changes. As the country modernizes its government and economy for the 21st century—most notably in its shift to parliamentary democracy, with its first-ever national elections held in 2008—there are signs that some Bhutanese may be leaving their traditional values behind. "Change Your Mind and Your Brain Will Follow"
Historically, the relationship between science and religion has resembled a divorce made in hell rather than a match made in heaven. But the two camps have recently found some common ground, thanks to an unusual series of dialogues between Western scientists and the Dalai Lama, recipient of the 1989 Nobel Peace Prize. Organized since 1987 by the Mind & Life Institute, a nonprofit that fosters collaboration between eminent researchers and leading figures in Buddhism, these dialogues point to the possibility of a new kind of relationship, one in which both partners contribute vital answers to one of life’s big questions: How can we overcome negative emotions and cultivate positive ones? Everything we are born with as a human being can be put to religious service. Worship is embodied, whether it’s orthodox, mystical, Eastern, Western, or indigenous. All of our senses and body parts can participate. Even the most intimate physical activities can serve religious goals. “Natural awareness is recognizing everything that’s happening without using a lot of effort,” says Sayadaw U Tejaniya. “You need to watch all day long, but you can’t be concentrating all day long. Meditation is for all the time—now, always, everywhere—not just to enjoy a stay in the forest on retreat.” He compares vipassana to running a marathon, not a 100-meter dash. We need to keep at it relentlessly, but in a relaxed manner. Instead of excessive mental and physical energy, a sense of patience and perseverance will build up natural momentum and further our practice. As Gertrude Stein might have said: A body is a body is a body. True, there are differences of shape, height, weight, size, color, texture, and so on. Bu, whether we are Yanomamo Indians in the Amazon basin, Vietnamese Buddhists, Moroccan Muslims, Russian Jews, Yoruba in West Africa, Indian Hindus, or French Catholics in Quebec, we recognize our physical manifestation as bodies of the same species.